Kidney disease is highly prevalent among patients with cardiovascular disease and is associated with worse cardiovascular outcomes. The evidence on which to base the optimal management of cardiovascular disease in patients with kidney disease is hampered by their continual exclusion from cardiovascular trials. This project aims to bring together a diverse group of public and private stakeholders in an effort to understand the barriers to including patients with kidney disease in cardiovascular trials and to identify potential strategies to overcome them. The workgroup began meeting in April of 2017 and anticipates completing the project in 2019. Kidney disease is highly prevalent (30% to 60%) among patients with cardiovascular disease and is a risk factor for worse cardiovascular outcomes.1,2 Thus, the management of cardiovascular disease in patients with kidney disease is a common and important clinical problem. The evidence base to guide optimal treatment recommendations is limited. The quantity and quality of randomized trials within the field of nephrology is low, and extrapolation of trial results conducted in the general population to patients with kidney disease may or may not be appropriate.2,3 About a decade ago, two systematic reviews observed that 56% to 80% of randomized controlled trials of cardiovascular interventions excluded patients with kidney disease, and a strong recommendation was issued at that time for their greater inclusion in cardiovascular trials.1,2 In order to work towards this goal, it is necessary to understand the barriers to their inclusion using a multi-disciplinary approach with input from a variety of stakeholders. In order to achieve these goals, drawing from the diverse membership of the Kidney Health Initiative, a workgroup of key stakeholders will be assembled: academic investigators (i.e., nephrologists and cardiologists who have conducted cardiovascular trials), academic and contract research organizations, industry, FDA, and patients with kidney disease. 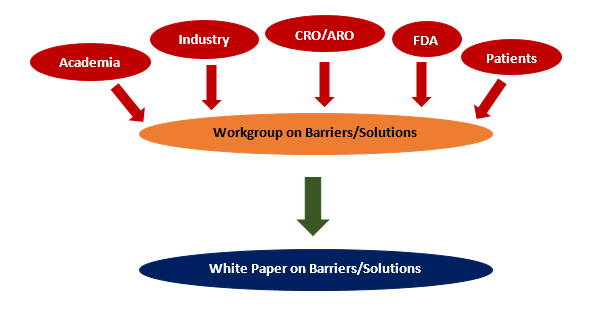 The deliverable from this project will be a white paper detailing the barriers to including patients with kidney disease in cardiovascular trials and potential strategies to overcome them. It is anticipated that the workgroup meetings, data collection and analysis, and writing of the white paper will be completed within a 12-month timeframe. This project would represent a unique opportunity for a diversity of stakeholders to work together towards improving the evidence base for the management of cardiovascular disease among patients with kidney disease and could stimulate the development of areas for future research (e.g., clarification of standards for the enrollment of patients with kidney disease into trials, survey of willingness to participate in trials for patients with kidney disease). Member Barbara Gillespie, MD, MMS, FASN Covance Inc.
Coca SG, Krumholz HM, Garg AX, Parikh CR. Underrepresentation of renal disease in randomized controlled trials of cardiovascular disease. JAMA. 2006;296(11):1377-1384. Charytan D, Kuntz RE. The exclusion of patients with chronic kidney disease from clinical trials in coronary artery disease. Kidney Int. 2006;70(11):2021-2030. Strippoli GF, Craig JC, Schena FP. The number, quality, and coverage of randomized controlled trials in nephrology. J Am Soc Nephrol. 2004;15(2):411-419.